Devon is a beautiful county; with gorgeous sandy beaches, acres of rural countryside, medieval towns and stunning harbors. No wonder it’s a highly desirable place to get married. 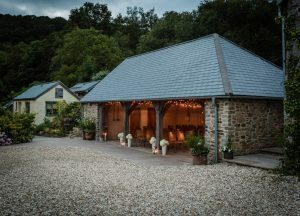 If you have always dreamed of a country or rustic barn themed wedding, Devon is the perfect place to host your big day. With plenty of options for country and barn venues, couples are spoilt for choice. 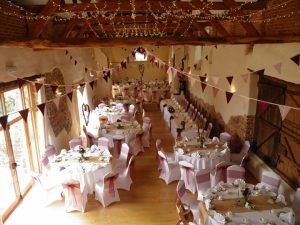 Here at The Wedding Secret we have found five of the more alternative venues around Devon to hold your barn or country wedding. Gone are the days of tradition – give us a nice, green country venue, surrounded by nature, plants and fields! g features which give it that rustic feel which other converted barns don’t necessarily provide. Although recently refurbished, it still feels very traditional. The walls are a combination of plaster and exposed brickwork, giving the barn a quirky look. This is a brilliant contrast, as full brick walls can sometimes darken the room, whereas with the painted white walls allow for plenty of light and opens up to an abundance of décor options. The wooden beams on the ceiling are a beautiful feature and one you can really go to town with decorating. One of the main focal points of this barn is a 17th century window frame which was originally used as a doorway. It boasts real history and makes that barn extra tick in the box. 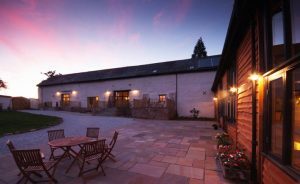 What we love about this venue is not only its barn, but the fact that the owners are doing as much as they can to keep their carbon footprint down and make all of their energy supply renewable – an added bonus if you’re an eco-friendly couple. This venue is literally all about being in touch with nature and we love it! 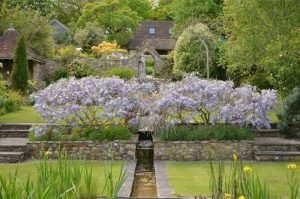 It encourages you to spend your entire wedding in the beautiful outdoors of Dartmoor in the Tamar Valley Area of Natural Beauty, so is absolutely perfect for couples who are very in love with the great outdoors. Couples can say their vows under the oak framed barn, with their guests watching from outside the archways! Of course they (the venue) are more than prepared for the British weather! A glass top marquee with clear walls is available for your wedding breakfast, allowing cover from the inevitable British rain but still enabling you to enjoy the outdoors. The terrace is the show stopper at this venue. Set against a brick wall and tiled paving, its glass topped roof gives you cover if the heavens decide to open, but also opens you up to nature around. 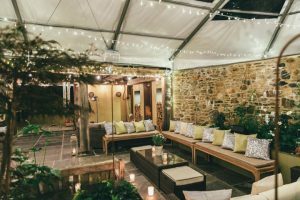 This classy area is kitted out with garden furniture, fairy lights and indoor planters, and is a place to unwind with the exposure of the gorgeous outdoors. If this wasn’t enough, there is also an exclusive honeymoon cottage for the couple, with use the day before until the day after. Decorated to complete luxury, you can wake up the morning after in complete and utter bliss. For those lovers of secret gardens or the great outdoors, this venue is perfect for you. With over seven different themed gardens spread across 13 acres of sweeping lawns, you can enjoy a huge range of flowers and plants in the beautiful outdoors. Who wouldn’t say yes? Particularly in the spring and summer months when the flowers are fully bloomed in all their glory. With this in mind, you are free to have pretty much anything or any theme for your wedding; whether it be a festival themed wedding or a marquee event. The gardens are there for your use, so you can design your day right up to the very last detail. It’s a rarity you get this much freedom so it’s perfect for couples who are very particular about their theme and need the flexibility. Although this venue doesn’t actually have a wedding licence, it’s becoming increasingly popular to be legally married in a registry office and then have the perfect blessing in the wonderful outdoors. The gardens really are a place to relax, enjoy and unwind and with plenty of space for guests to explore the different gardens. Your secret garden wedding at Burrow Farm Gardens will be an unforgettable one, we promise you. For a total DIY wedding venue, Country Ways is available to brides and grooms for your complete use. This working farm in North Devon has ample space, self-catering cottages and a licenced corn barn. This venue is essentially a tiny village, with six cottages and a barn exclusively for you. The perfect get away for you and your closest ones for a whole weekend (or a few week nights ). The rest is up to you! Marquees, tipis, bell tents or other structures can be erected to create your dream DIY wedding venue. From a festival vibe to a rustic style wedding, the choice is entirely up to you. 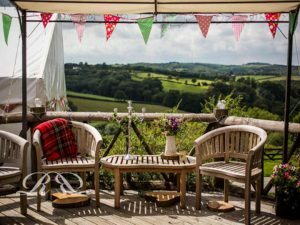 An added bonus to this venue is the endless gorgeous views across the Devon countryside and 40 acres of private grounds at your disposal. Still not tempted? We’re surprised! Devon has so many more beautiful country or barn venues to offer so with a bit more looking, we’re sure you can really have your dream wedding.